I remember back when we were still in the early days of planning for smallholding, reading everything we could, and spending a lot of time on The Accidental Smallholder (TAS) forums. One of my many questions there was about babies and smallholding, would I be mad to start both at the same time? In my utter inexperienced view I figured I would be pregnant and be working away at the land and whatever house we were renovating until the late stages. Then, as new born babies sleep a lot, I would continue working on things after baby was born but with baby asleep in a sling or pushchair. As baby got older I’d just use a play pen or something wherever we are to keep baby contained and occupied. Then when I have a toddler I’d incorporate them into what I was doing and all would be fine and dandy. Oh how differently things turned out. I got quite bad SPD during the pregnancy which had me on crutches from 20 weeks. It took me a fair while to be able to move freely after the birth, talking 4 or 5 months before I could move like I could pre-pregnancy. My new born did sleep a lot, but on me and we didn’t get along with the whole baby wearing. I did manage to get her down in the pushchair but only for a single 2 hour nap a day. During the summer I used those two hours well, working away on some project while she dozed. If she woke mid-project I’d often try and carry on whilst holding her. All hands on deck – even if you only have one free! As she got older and was tottering about I tried the whole play pen but my Chi is very *ahem* strong willed and independent, she needs to be doing what you are doing and doesn’t like to settle for pretend ‘baby’ things when you are doing the real thing. Apparently very similar to me as a baby… Unfortunately, she isn’t quite at the stage of being helpful. We did manage to get her picking red tomatoes, but she had a tendency to throw them into the basket, and she would stay in one spot, pick the red ones, then the orangey ones and then start on the greens unless you quickly diverted her attention to a new patch of reds. Don’t get me wrong, starting this smallholding with Chi has made it so very special. 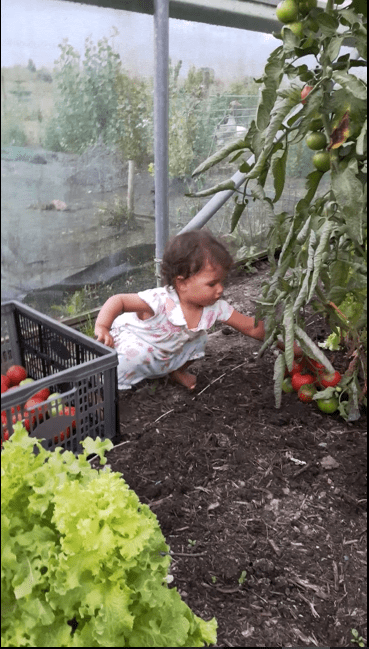 It’s an amazing feeling to see your 12 month old watering the veg beds, your 13 month picking tomatoes, your 15 month old digging for potatoes and your 17 month old sorting through the windfall apples and pears. She even baaas at the sheep now. Seeing her interacting with the animals and land, knowing the food she is eating is fresh and seeing her get involved with preparing the food (she can now peel leeks and garlic) makes me think ‘Yes, this is why we are doing this, this is what it is for.’. 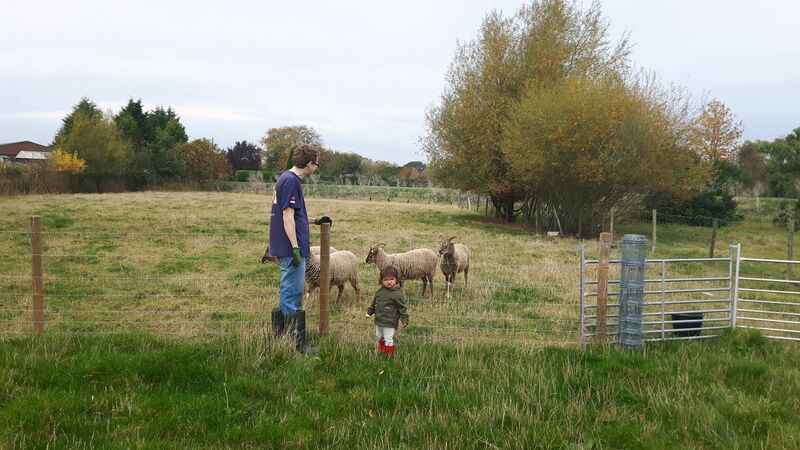 But, and there is always a but after a ‘don’t get me wrong’, sometimes I do think we were mad to do smallholding and starting a family at the same time. The past week Chi has been down with the flu which has gone to her chest. I’ve been keeping her in and looking out the window wistfully at the apples on the floor, the shed that needs work, and (when I do a quick morning or night run) the beds in the polytunnel that need sorting. I tried taking her out the other day for her nap and she just kept being woken up by a coughing fit, only seems to be sleeping at the moment whilst lying on me. It’s not just when she is ill either, sometimes she is just too inquisitive to take out when she is wide awake. I can’t have her running around in the goose area whilst I’m tackling the brambles that are swamping their house and she gets too frustrated awake in the pushchair. 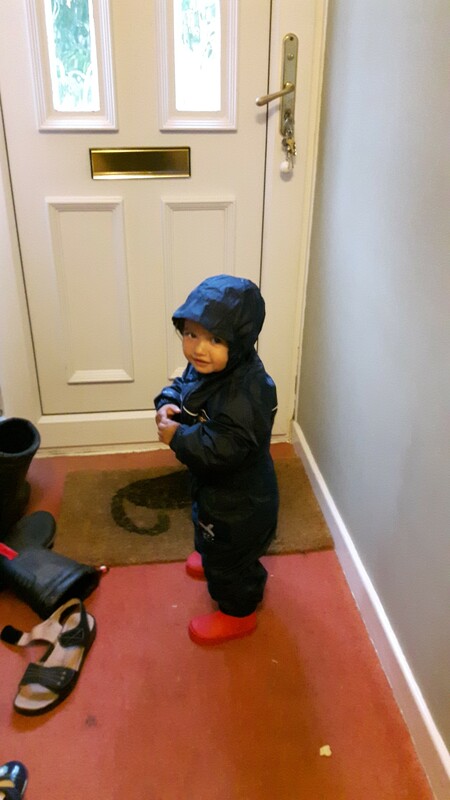 Or it’s raining and no matter what rainsuit I buy she always seems to be soaking if we go out in the rain. Or, as has been the case the last few weeks, it is just too dark. 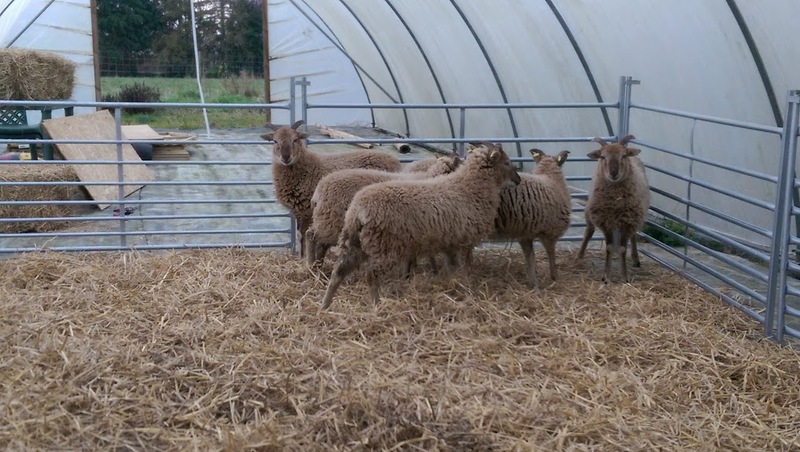 I felt really disheartened the other week as Sam had the day off and we prepared the polytunnel for the tup. We were really getting into the swing of things and making progress. We were about to start another job but we checked the time. Half an hour until sunset, time to have one of us do the night run for the animals and then we head in. 3:30pm. If we didn’t have Chi with us we would have got the lights out and worked in the polytunnel after the night run but just no can do with Chi. Tonight I’m feeling slightly disheartened again. We have to drive up North, over to Sheffield way, to collect the tup tomorrow (so late I know). Sam made the suggestion that I should stay with Chi. It’ll be 3 hours there, load him up and do the paper work, then 3 hours back, unload him and get him settled. Chi is still ill and grumpy and crying over everything. 6 hours in a car seat, eating lunch in the car, will not be pleasant for her, or for us. I feel like I should be there, I have been talking with the guy to arrange this hire, I’m the one who wants us to have sheep, I’m the more physically able. But it’s not in Chi’s best interest, so I will stay, do what I can here and have a cup of tea and dinner ready for Sam when he gets home. I was reading an article in Country Smallholding the other day about a family that are doing flowers on their smallholding. They had started with animals but it was too much work with young children. The lady said that when they are both in nursery/school she might get the animals back. It reminded me again about thinking we must be mad to try and do it with Chi and be thinking about baby #2 at some point. It would all be so much easier if we didn’t have Chi, if we had set everything up before her, or waited until she was older to set things up. But writing this post and looking through the pictures of her on the smallholding I don’t think we are mad. We’ve made it harder for ourselves for sure. It certainly isn’t as easy and rosey as I expected, but seeing it all through her eyes, seeing her interact with it all makes the delay in getting everything done worth it. I’m still banking on her being really useful in getting things done in a couple of months though! Life has a way of getting in the way of living sometimes. You don’t speak to friends and when you do you apologise because ‘life’ got in the way. With having a little person around 24/7 and a husband who works full time I often find that ‘life’ is getting in the way of smallholding. We try and limit our trips away and make sure we have a few weekends a month to get on with the tasks. This autumn though ‘life’ hit us hard. My stepfather, Paul, died suddenly. I knew he wouldn’t live forever but I thought we had at least another 10 years. He had been instrumental in my life, he even bought our smallholding for us whilst we sold our previous house, thankfully we paid him back in full a few months ago. My family was hit hard by his loss and as he died abroad the burial proceedings were drawn out. It ended up being a month from his death to his funeral. In that month I was home maybe 2 or 3 days a week, the rest of the time spent with my mum in London. Sam was home a bit more but for the majority of the time we got sitters in. In terms of the smallholding it wasn’t what I wanted at all, every time we’ve been away previously we’ve had someone staying over. The sitters were coming in for the morning and night runs, checking up on the animals and doing food and water. When I was home I would do the cleaning out of houses, water buckets and some harvesting. Literally just before we found out about Paul I’d been really happy about how we were doing on the holding. My vet friend Cassie had been over for a weekend and showed us how to trim the sheep’s feet, we’d put up the first of 2 fences to subdivide the sheep field and I was filled with that feeling of pride you get when you see your holding through someone else’s eyes. 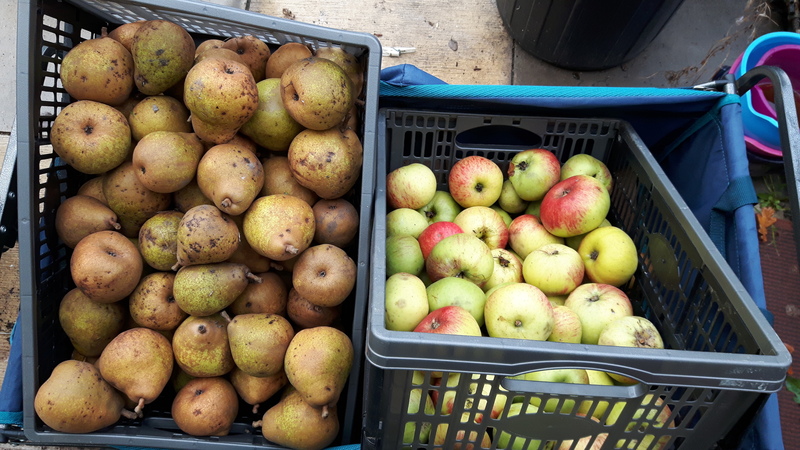 It felt like we were finally getting on track, I had some things to plant in the polytunnel, our local garden centre was selling old stock of organic manure dirt cheap and a trip with the trailer was planned and the apple and pear harvest were approaching. Life was good. I came in to do dinner and Sam did the night run, as he stepped in the door the phone rang and the world fell apart for me. On the times we came back to the smallholding we did what we could but you could literally see things falling apart. The first time back after a week away the polytunnel was heaving with fruit flies all over the tomatoes and the peppers, the onions that I thought were ok still in the ground had started to sprout green stems again, the fruit trees we’d impulse bought in our garden centre’s sale were looking worse for wear, the felt roof of the goose shed Paul had helped us build was flapping in the wind and I didn’t have the energy to make the calls needed about our incoming ram lamb. I felt awful about it. Paul had been so proud about what we were doing, he’d boasted to people at my daughter’s birthday in June that nothing goes to waste here, but things were. All in all the smallholding survived. The animals were ok. I guess that goes to show that whatever is happening life does go on, and that my gold standard of care for the animals can slip in emergencies without the world ending for them. Now we are back, have been for about 2 weeks, and we are ‘cracking on’ as he would say. We’ve done the second fence in the sheep field so we now have 3 areas to rotate around. The buying of the ram lamb has been replaced with the hire of 3 year old tup as the owner isn’t sure the ram lamb is up to the job, we’ll buy him in the spring and not use him on his half sisters. 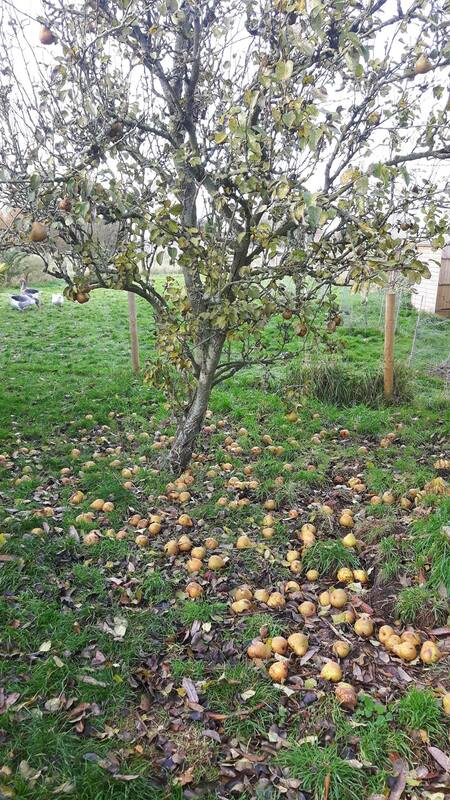 We are trying to get on top of the apples and pears but a lot have been lost. We did two large batches of pear wine (neither worked) and 2 batches of apple wine (both very tasty) last year. This year I don’t think we will have enough fruit for wine. We also stored cooking apples through until the new year but we currently have about 3 that are ok to store. Tomorrow we are back out on the land so we’ll be focusing on apples and pears, hopefully I’m just underestimating numbers. ~ The smallholding can be managed in the short term by someone coming in morning and night. ~ ‘Life’ will get in the way sometimes, and that is ok.
~ Life is too short – I think we will be going on holiday more than I had originally thought. ~ I do want to do this – sometimes I have thought that smallholding isn’t working but I want to succeed at this. Paul put effort into helping me get into this way of life and was proud of my achievements so far. I want to keep making him proud. Maybe this is more a personal post than a smallholding post but I am sure this will happen, and indeed has happened, to other smallholders. Before it did I wouldn’t have thought it would be possible for me to be there for my family whilst I had the holding to look after but it can be done, sometimes ‘life’ is important enough that you have to allow it to get in the way. Hopefully more smallholdery posts soon. Well it’s harvest time and with that comes preserving time. I’ve not had much experience preserving foods, freezing, turning into wine a single go at red onion chutney and hawberry sauce is the extent of my dabbling. That needs to change now that I am smallholder. We want to still be eating our home grown foods deep into winter. We had a little go at pickling cucumbers but then I didn’t feed the plants and the harvest wasn’t great so that was 3 or 4 jars that were only set to last a couple weeks in the fridge. Not going to see us through winter there. 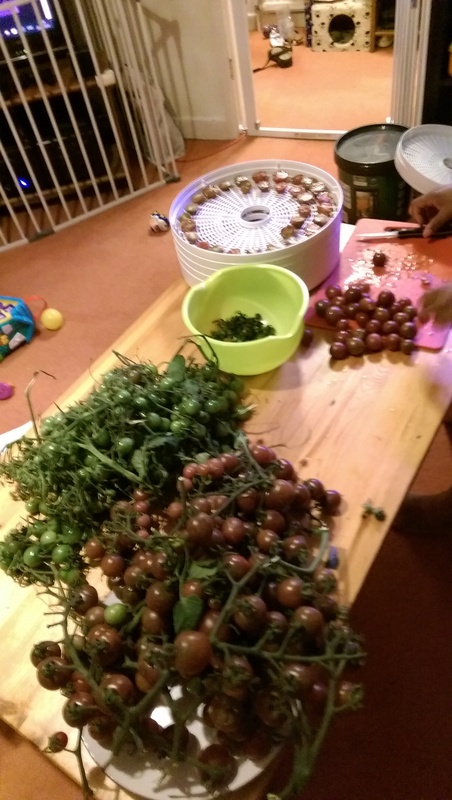 Then the tomato harvest came in and it was truly a glut. The first wave was about 12kg of tomatoes (two different salad types and one cherry) and Sam reckoned that would be about a quarter of it. We needed to get preserving and fast! The cherry tomatoes went into the dehydrator and turned into a very tasty treat that I didn’t even know I liked. I think sundried tomatoes in oil put me off of the idea of dried tomatoes and I’d never been a fan of dried fruit. The smell that filled the room whilst the dehydrator was running was divine and we soon found that the end product was quite addictive. We still had the salad tomatoes to deal with though. In hindsight most of our tomato consumption is in the form of sauces, both for cooking and condiments. With that in mind we should have gone for very fleshy tomatoes rather than about 15 salad tomato plants. We will learn for next year! We decided to still try and make passata despite our poor choice in variety. After all there was no way we could eat that quantity of tomatoes fresh and we aren’t set up to sell at the gate yet. We had two methods to try. The first was out of the River Cottage book. 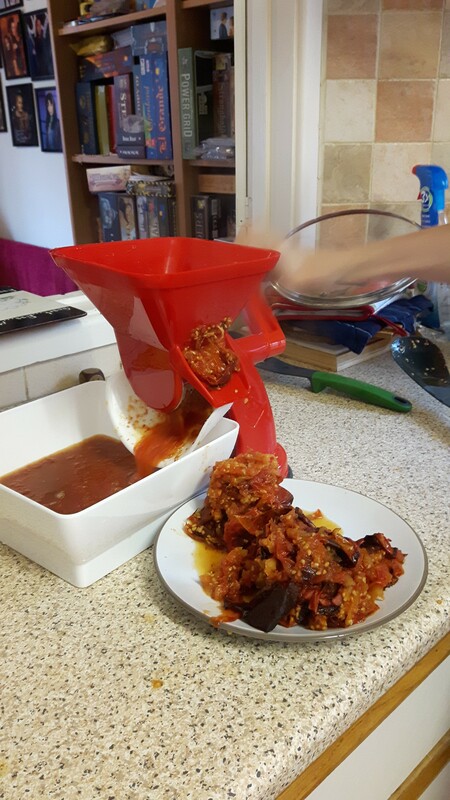 Basically chop your toms in half, stick them in an oven for an hour, press through a sieve or passata maker (we didn’t even know these existed), bring to the boil and bottle. The second was from an Italian friend of mine, Cassie. Pop your toms into boiling water to split the skin then peel (a lot easier than it sounds), chuck them in a pot and cook until it’s at the thickness you want then bottle or push through sieve and bottle. 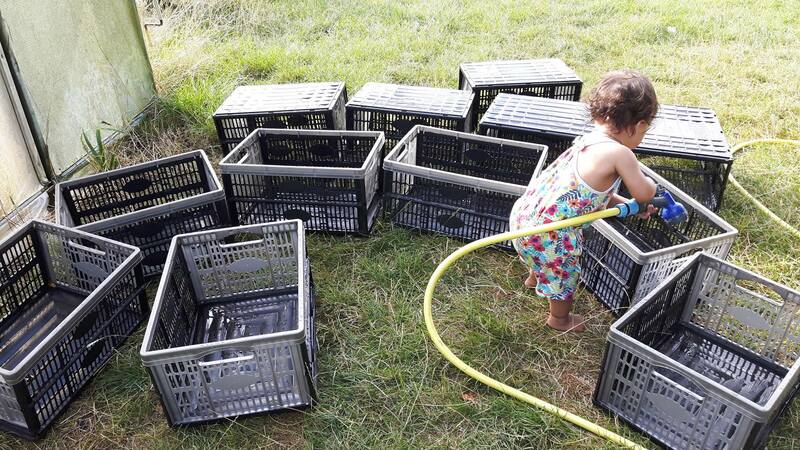 We tried both methods and, although the River Cottage was less labour intensive to start, the pushing through the sieve took a lot of time and effort and I don’t think it was very efficient. We did get a beautiful thick sauce though, maybe more paste than passata. Would be a great base for ketchup, which is another thing I am hoping to make. The Cassie method was daunting but I actually really enjoyed skinning the tomatoes. The boiling down took forever, was on the hob for most of the day before it got to the right thickness and by that point I couldn’t be bothered with the sieve. It was bottled seeds and all but actually makes really good base for sauces, I’ve used a couple already. Despite peeling the tomatoes and the length of time it takes to cook it actually feels like a less labour intensive method because you just leave it be for a lot of the time. We have since harvested 3 more batches of tomatoes and the Cassie method has been the one we stuck with, until the most recent batch. We decided we like making and cooking with passata so much that we should buy a passata machine. We switched back to the River Cottage method and ran the toms through the passata machine when they came out of the oven. Thick seed free sauce that was quite quick to make. I’ll probably do a batch or two each year the Cassie method as I think having the seeds in worked really well for ratatouille, which we eat a lot at the moment thanks to our abundant courgette and aubergine plants! So we can now add dried cherry toms and passata to our list of preservation methods conquered. I am hoping to have a go at ketchup as well, but for now I’ll be satisfied that we have coped with our first real glut! Well it has been a long time since I last checked in with you but there’s been good reason. For valentines day my true love bought me a website! I’m not very good with websites, and an 8 month old makes everything take 3 times as long but we are up and running at www.sixoaks.co.uk so you can read all about us over there! Don’t worry I haven’t just been sitting on the laptop, we’ve been very busy outside too. First we had a wonderful weekend with some friends we hadn’t seen in a long time. In true smallholder style we put our guests to work and planted those fruit trees in our new ‘orchard’ and netted it off ready for the goose move. 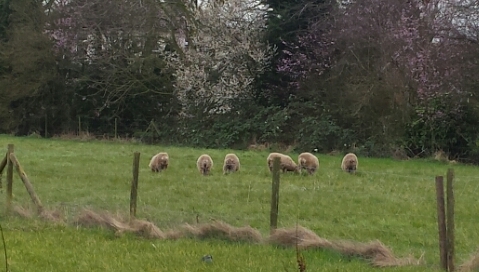 We took a day trip up to Sheffield to check out our potential new sheep. Leaving the chickens and the geese for a day was a little nerve wracking but it was worth it to check the sheep out and see someone else’s set up. The more smallholdings we see the more ideas it gives us and the more confidence it gives me. No-one’s smallholding has the perfect conditions for everything. We then had the regular helpers, Lis and Kay, over to set up protection around the new trees, move the geese into the ‘orchard’ (that was fun!) and clear the last of the chicken wire from the sheep field ready for their arrival. Somehow we managed to take no pictures at all that weekend. Next up was the actual arrival of our six sheep and the vet visit (vaccination, worming and faecal sampling), which all went surprisingly smoothly. They are a bit timid and skinny, but they should get used to us and fatten up on the grass. We now have the task of working out who will stay and who will go for meat. 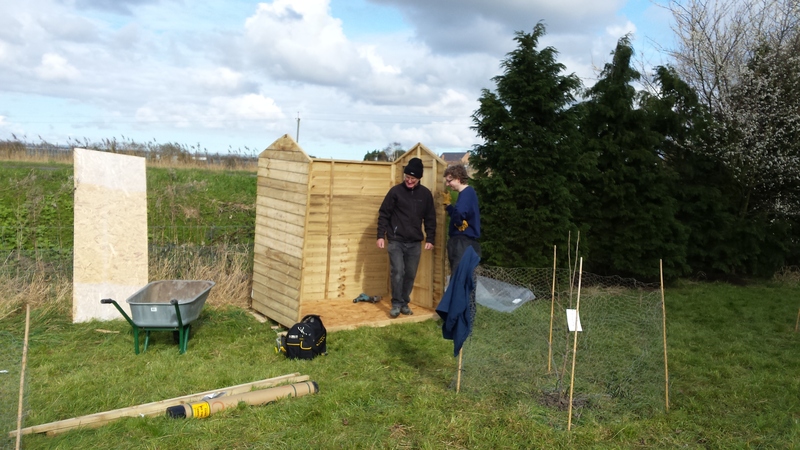 That weekend also saw the building of the goose shed (finally!). They have straw in there and some grit and layers pellets but they are spending most of their time outside, still laying outside and I haven’t tried shutting them in yet. Getting the shed up with the geese still in the area with my step-dad and nephew was a bit daunting but they kept their distance in the end. The most recent developments have been the turning out of the sheep (which included one very short escape run by one of the sheep), the introduction of rubber eggs to try and get the hens to lay in the nest boxes and getting some more veggies planted. Our next projects are fencing off a new area for the geese as they are running short of grass, building a rain shelter for the sheep and looking into drainage options. It’s been raining all day today and we really are starting to look like we have several ponds :-/ We should now have all our livestock for this year, except for a tup and maybe a wether this autumn. Oh and maybe some more hens (still plenty of space in the hen house) and some goslings if I let April sit hmmmm…..
It’s been a long two weeks since my last update. The first week not much happened. I succeeded in day to day care of our animals, the geese (April, May and June) and the cockerel (Casey). We discovered our limitations as a weekend went by without much progress due to Sam having a sore foot and Chi being very clingy with teething. We did however get our first egg from May (which made a very yolky scrambled egg), realised that June is in fact a boy who is now renamed Jules, got the hen house a bit more set up and saw the first seedlings peeking through the soil (radishes). I also made some progress with the geese, no longer having them try to bite me every time I go anywhere near them. This past weekend we really buckled down though. 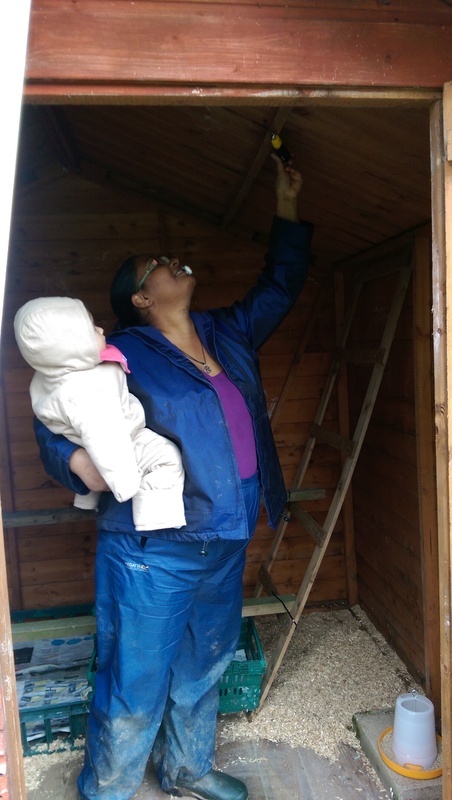 There were two main priorities, 1) move a builders bag of soil into the polytunnel and 2) prep the hen house for the girls. We did a pretty good job at meeting both of those. On Saturday we had the wonderful Lis over and made short work of the soil. The second veg bed in the polytunnel isn’t quite a no-dig as I forked the surface a little just to break up the crust. I’m much happier with this soil than the last batch though, we didn’t find a single bit of glass in there. It’s now all levelled out and waiting to be planted in. 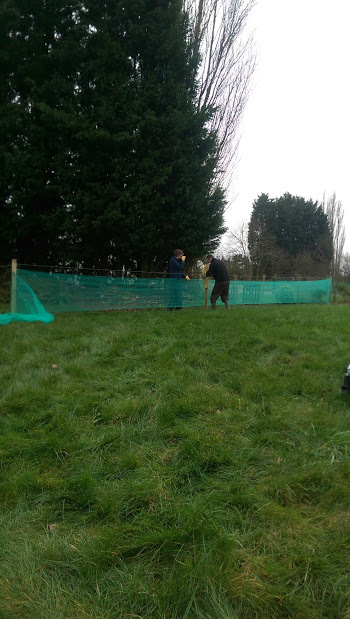 I also cleared some more of the chicken wire from the sheep field, getting ready for the arrival of sheep. Sunday was all hands on deck. We had another volunteer friend over, Kay, as well as her parents in the afternoon. Together we stripped the old roof off the hen house, treated some rotten bits and got a new roof on. We also got the feeder and drinker hanging, sanded the perches to give a bit of a rounded edge and installed a nest box. Thanks to the help of Kay’s dad we also got some more fence posts hammered into the sheep field. As if that all wasn’t enough, over the course of this week we’ve installed a pop hole in the hen house, made a makeshift shelter for the geese in the sheep field (there’s a shed on the way for them), had two more eggs, planted some fruit bushes, started making the outside veg beds and marked out an area (our mini orchard) for the geese to move into this weekend. Oh and we’ve arranged to buy some sheep at the end of the month. It really does feel like all things go at the moment, unsurprisingly we’ve been in bed quite a bit before midnight this week! Hopefully I’ll be able to update a bit more often than once every two or three weeks. Our journey to smallholding probably began when we moved to our first house in Scotland and started a fruit and veg garden. Self-sufficiency became an interest, wanting to know where our food was coming from, and after a bit we began to dream about our next house, one we would move to once I had finished the studies that had brought us to Scotland. We have lived all over the UK and whilst I have a fondness for the North West we searched everywhere for the right place, with viewings in Scotland, Wales and England. Six years later we found this place, 2.5 acres of flat, fairly good grazing, with some impressive polytunnels and established fruit trees in Lincolnshire. It was less land than the 10 acres we had dreamed of, and it borders a well trafficked road, but the house wasn’t in disrepair and I was heavily pregnant so we went for it and moved in when our daughter was 10 weeks old, late August. I had so many plans. We would do any repairs needed to the fencing, buy a 4×4 and a trailer and get the sheep in autumn so they could keep the grass down. We’d also get some veg beds made in the polytunnel and outside in time to get autumn garlic and onions in. Oh and we’ll paint the inside of the house. Oh and chickens, yes we could get some chickens if we’re quick and do it before the light stops them laying. And of course we’ll get some hedges and fruit bushes and fruit trees planted in Jan. I don’t think we would have done all that even if we didn’t have a house to unpack, my husband had a full time job, I was recovering from severe SPD from the pregnancy (only just off the crutches when we did the move) and recovering from a c-section, oh yes and the small matter of a baby! To top things off when we got here the fruit trees were dropping their fruit and I’m of the waste-not-want-not mentality. 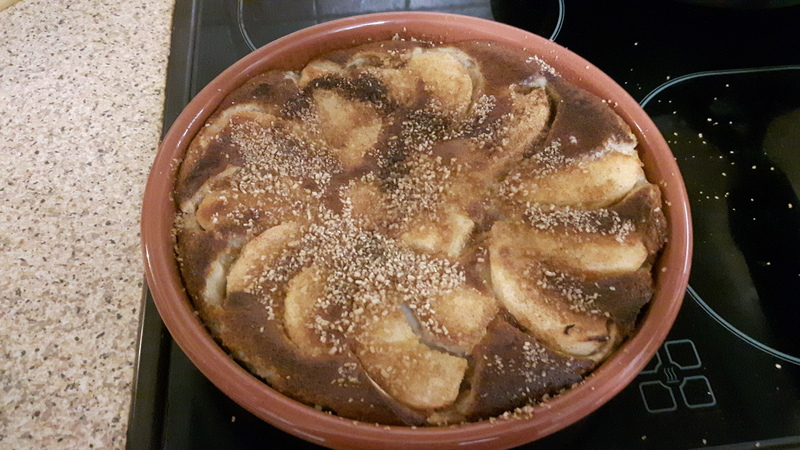 Plums and apples and pears kept us busy well into November. I don’t think I’ve eaten so many apple crumbles in my life! We made 5 gallons of apple wine, 10 gallons of pear wine (5 of Williams, 5 of Conference), 5 gallons of plum wine and 5 gallons of spiced apple. We still have a freezer full of fruit and there are apples stored for me to process! As such we are still knocking fence posts in where there are rotten ones in the sheep field (only one long side left to do!). Still clearing brambles and tall grasses and saplings to actually get to the fence on the boundary side of the sheep field. This past weekend we did make progress on the growing front though, we started on the veg beds in the polytunnel. We now have a 6x1m bed that we’ve chucked some seeds in and the outline for a second bed. The grand plan is to have 6 beds in that one polytunnel. We’re trying no dig, although I’m not sure how well that will work. Will post in detail about it later. First no-dig veg bed in the polytunnel, all planted up. We also made progress on the livestock. Our neighbour moved and gave us his geese and abandoned his cockerel so we took him in too. We now have April, May and June (who I suspect is John) our 2015 born Toulouse geese, as well as Casey our cockerel of unknown breed and age, but I think is quite young. The girls, April, May and June. We managed in true smallholder style to knock up a chicken hut from an old shed in the back garden and things we had lying around. It must be pretty alright as Casey took himself to bed the first night it was done. Need to get some nest boxes, a pop hole and better ventilation before we can get the hens but I’m pretty chuffed with it. We also need to get a shelter sorted for the geese. Casey sunning himself in front of his house. We aren’t doing things perfectly, I’m not sure there are any smallholders that do but we are getting there, fumbling our way through. I’m sure we’ll make a lot of mistakes and in years to come I’ll read this back and think ‘why oh why did you do that’, but we will keep trying and we will keep animal welfare as our #1 priority. I’ve said we a lot in this post. The team behind Six Oaks consists of me (Dans), my husband Sam, baby Chi and our incredibly helpful volunteer Lis (without whom I think we would have only managed half the things we have so far!). 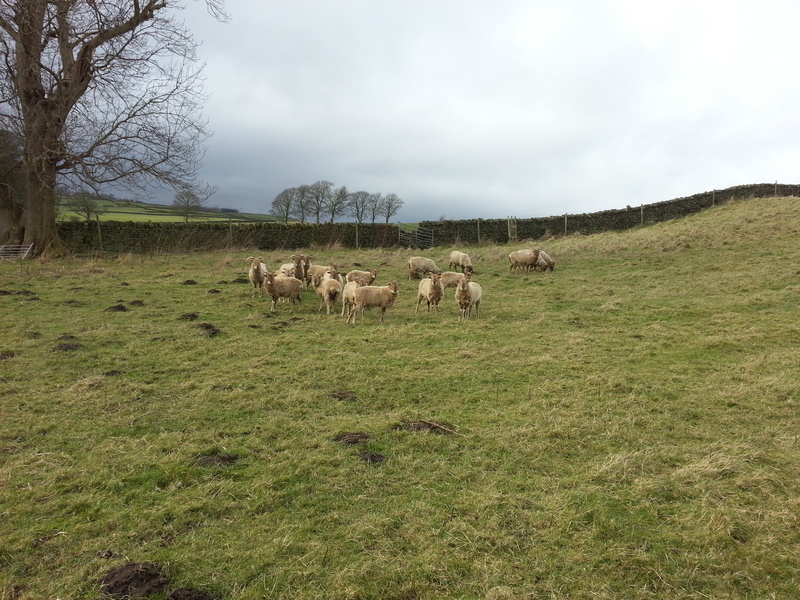 If you’re interested in smallholding without a smallholding check out her blog smallholdingbyproxy. Right as the baby is sleeping I better get myself to bed, I’ve got a chicken to let out early in the morning and some geese to attend to! Hopefully there will be more posts from me soon.